The 1999 season was barely three weeks old. The visiting St. Louis Cardinals were looking for their 10th victory of the season, while the hometown Los Angeles Dodgers were looking for win number nine. Before a crowd of 46,687 on a Friday night, the Cardinals' Jose Jimenez squared off against the Dodgers' Chan Ho Park. Jimenez pitched seven innings to earn his second win of the season; Park did not last three innings. However, he did pitch enough of the third inning to make history. Each team mustered 11 hits in the game, but St. Louis put together six of theirs, two walks, a hit batsman, a batter who reached on a fielder’s choice, and another batter who reached on an error — 11 baserunners — in an explosive third inning in which they scored 11 runs. Powered by third baseman Fernando Tatis, the Cardinals sent up 14 batters in the top of the third. Tatis did something no other major leaguer has accomplished through the 2014 season. He slugged two grand slams in the same inning. Los Angeles scored single runs in the first and second innings and led 2-0 as the Cardinals came to bat in the top of the third. The Cardinals had managed three baserunners and a stolen base in the first two innings but didn’t score. For Los Angeles, Gary Sheffield hit a sacrifice fly to plate Eric Young in the first inning, and Todd Hundley hit a sacrifice fly to score Devon White in the second. In the top of the third, the first three Cardinals (Darren Bragg, Edgar Renteria, and Mark McGwire) all reached to load the bases. Third-base coach Rene Lachemann held Bragg at third after McGwire’s bloop single to right field. On a hitter’s count, Tatis clobbered a 2-and-0 offering into the Dodgers’ left-field bullpen, giving the Cardinals an instant lead. J.D. Drew grounded to first. Eli Marrero homered to deep left field. Pinch-hitter Placido Polanco walked, as did Joe McEwing. Pitcher Jose Jimenez reached on a fielder’s choice (a sacrifice bunt that Park threw wide to third base). Bragg, Renteria, and McGwire all came up with the bases loaded, and each at-bat ended with the bases still loaded, as Bragg reached on an error, Renteria singled with Jimenez holding at third, and McGwire popped out. This set the stage again for Tatis, who rocketed a full count pitch off Park, still laboring, into the pavilion past the left-center fence. Tatis had seen nine pitches in the inning and he had knocked in eight runs. After the second grand slam, Dodger manager Davey Johnson pulled Park in favor of Carlos Perez. 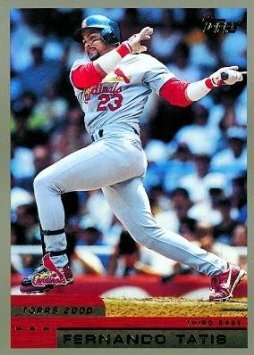 Until Tatis, Mark McGwire had been the only member of the 1999 Cardinals to have hit two home runs in the same inning.1 However, McGwire had been with the Oakland Athletics at the time and only one of the home runs had been with the bases loaded. Describing Tatis’s feat, a reporter for the St. Louis Post-Dispatch wrote, “Two swings of his bat, two thunder bolts into the Southern California night.”2 McGwire made both of the grand slams possible for Tatis. In his first at-bat in the third inning, McGwire singled to load the bases; in his second at-bat, he popped out to shallow right field, keeping the bases loaded for Tatis and the history books. St. Louis added a run in the top of the sixth when Drew hit a two-out solo home run. Jimenez was cruising through the Dodgers lineup, at one point retiring nine in a row from the fourth through the sixth. In the seventh, however, he allowed three singles and a walk, giving up two more runs. Manny Aybar came on in the eighth to pitch for the Cardinals and allowed a run on a double and two groundouts. That ended the scoring in the game. The Cardinals cruised to a 12-5 victory over the Dodgers. The author wishes to thank Rachel Hamelers, science librarian and reference services manager at Trexler Library, Muhlenberg College, for her assistance with obtaining sources. Crothers, Tim, “In the Name of the Father,” Sports Illustrated, June 14, 1999, 80. Verducci, Tom, and Jeff Pearlman, “Slam Dancing,” Sports Illustrated, May 3, 1999, 78. Hummel, Rick, “Tatis Hits Two Grand Slams in Third,” St. Louis Post-Dispatch, April 24, 1999. Hummel, Rick, “Scully Relishes Tatis Slam Call,” St. Louis Post-Dispatch, April 25, 1999. Hummel, Rick, “It was a Grand Night for Tatis: Cards Third Baseman Basks in 15 Minutes of Fame After Slams,” St. Louis Post-Dispatch, April 25, 1999. Miklasz, Bernie, “Tatis is Showing Ability to Handle Sudden Celebrity,” St. Louis Post-Dispatch, April 26, 1999. 1 Rick Hummel, “It was Grand Night for Tatis; Cards Third Baseman Basks in 15 Minutes of Fame After Slams,” St. Louis Post-Dispatch, April 25, 1999. Mark McGwire had only six RBIs in the young season, but Tatis had eight after two swings in this game’s third inning. 2 Bernie Miklasz, “Tatis Is Showing Ability to Handle Sudden Celebrity,” St. Louis Post-Dispatch, April 26, 1999. 3 Rick Hummel, “Scully Relishes Tatis Slam Call.” St. Louis Post-Dispatch, April 25, 1999. 4 Tom Verducci and Jeff Pearlman, “Slam Dancing,” Sports Illustrated, May 3, 1999, 78. 6 Rick Hummel, “It was Grand Night for Tatis; Cards Third Baseman Basks in 15 Minutes of Fame After Slams,” St. Louis Post-Dispatch, April 25, 1999. The four previous teams to hit two grand slams in the same inning were the 1962 Minnesota Twins, the 1969 Houston Astros, the 1980 Milwaukee Brewers, and the 1986 Baltimore Orioles. 7 Tim Crothers, “In the Name of the Father,” Sports Illustrated, June 14, 1999, 80. Tatis borrowed teammate Eric Davis’s bat on this night. 9 Rick Hummel, “Tatis Hits Two Grand Slams in Third,” St. Louis Post-Dispatch, April 24, 1999.